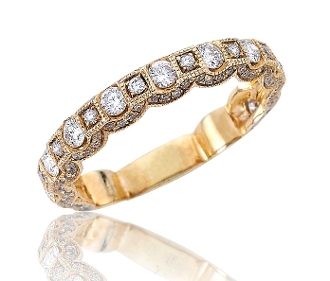 Beautiful and encrusted with brilliant round cut Diamonds, totaling 0.91 Carat t.w., this one of a kind Diamond Eternity Ring is sure to bring years of pleasure to that special women in your life. Set in 14 Karat yellow gold with milgrain detailing, bezel set Diamond solitaires alternate size throughout the design, accented with a lace-like draping of even more pave set Diamonds. With a high polished finish this ring is sure to wow her! For added appeal personalize your item, select our Engrave option and indicate size needed when adding to Cart.